Take a look at CHRYSPAC's On-site Warehousing Considerations. Storage space, shipping and receiving services are provided for intermediate to small volumes of material. Contact Chryspac to learn more about specific types that we provide warehousing solutions for, and learn how this solution can improve or streamline your productivity by considering our Fulfillment services. Our facility is capable of a variety of storage services tailored to the unique requirements of each customer! 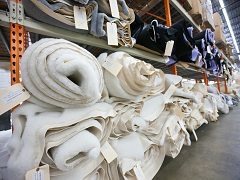 Reduce your inventory storage and cost by utilizing our facility to warehouse any potential on-demand supply of products or material, especially when you need fast turn-around!